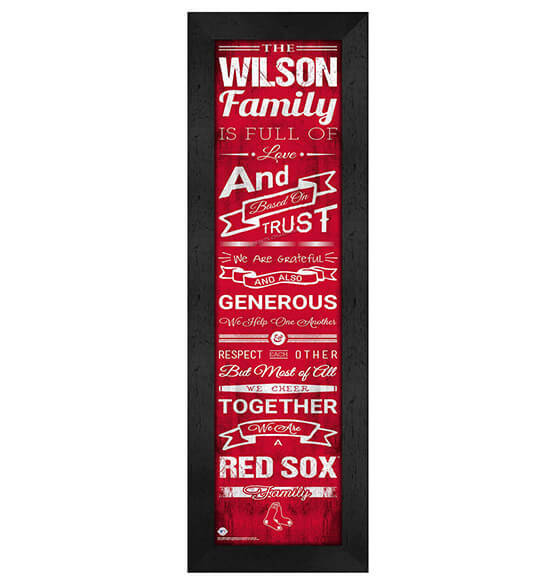 Combine your love of Boston Red Sox baseball and your love of family with this Personalized Family Cheer Custom Wall Art. Ideal for friends, family and co-workers, this baseball gift is guaranteed to be a thoughtful, heartwarming favorite for anyone devoted to the all-American game. Featuring the BoSox's team colors, this vibrant personalized home decor is sure to thrill recipients with its premium-quality MDF vinyl-wrapped frames, glass and paper. Our custom Boston Red Sox sports decor arrives with an included, installed sawtooth hanger for easy mounting. PersonalizedThings by Exposures is here to help you celebrate life's memories!